← Is America the best place on Earth for entrepreneurs? The other day I had one of those Aha! moments. It was such a small thing that at first I didn’t think much of it. But as I contemplated my “discovery,” I realized it had repercussions for other areas in my life. You might say it was a rediscovery of an age-old truth: We humans are a bundle of habits—some good and some not-so-good. 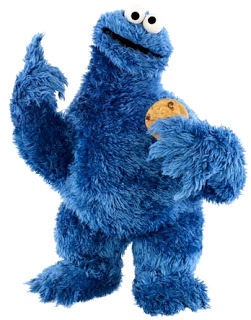 Eating too many cookies is my bad habit. The reason is because I’m a creature of habit. For years, I shaved and showered and got dressed upstairs in the master bathroom. But the hot water cartridge in the shower went bad. No problem, I thought, I’ll just go down the hall to the guest bathroom. But then that one went bad, too (and a plumber told me it would cost $300 per shower to fix). Undaunted, I started using the shower in the basement. It’s only temporary, I reasoned; I’ll soon get those upstairs showers fixed. As I thought about this one, small aspect of my life, I started to review my other habits. Why are things placed “just so” in my house and office? Why do receipts always go in that one over-stuffed drawer? Why do I put the mail on the kitchen counter and change on the dresser? Those are just teeny, tiny habits. What about bigger habits that shape our workday or affect our relationships? As I thought about this, I noted my failure to break some fairly powerful habits in my life: eating too many snacks, failing to exercise every day, piddling around in the morning as I drink my first cup of coffee, and the list goes on. About a year ago, New York Times business reporter Charles Duhigg wrote a best-selling book called The Power of Habit that explores the science of habits, how they work and how they can be changed. 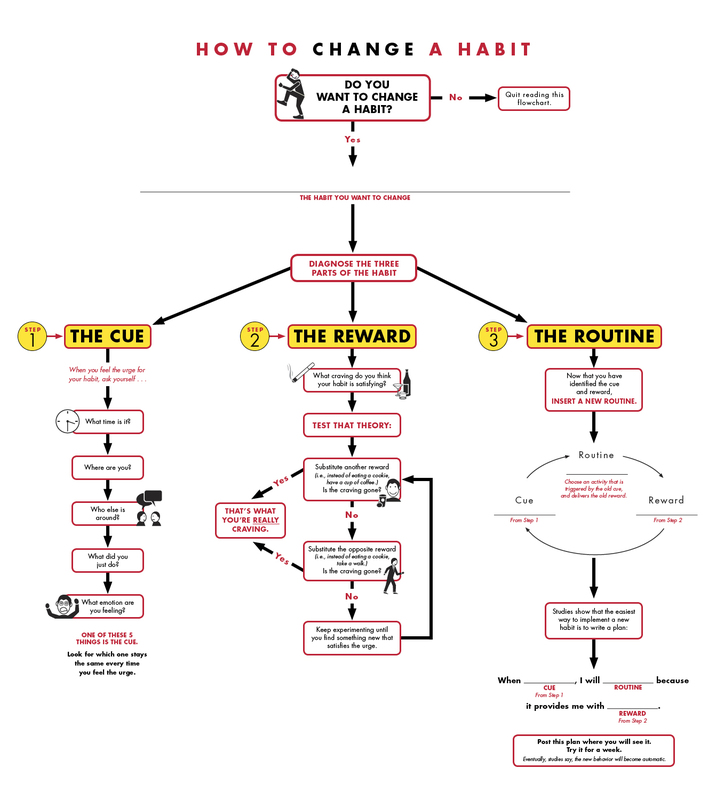 I haven’t had a chance to read the book, but luckily he’s produced this handy infographic on how to change a habit. Identifying the cues that lead to the habit you want to break is important. So is substituting new, healthier habits and creating a new routine. As I noted in my January post “7 tips for achieving your New Year’s resolutions,” it’s important to understand the underlying motivation for our behaviors, or as Duhigg puts it, the craving that our habits satisfy. Once you understand the cues surrounding your habit (like drinking a cup of coffee first thing in the morning), you can begin to experiment with alternative rewards. The goal is to find a healthier habit that satisfies your craving and that you can incorporate into your routine. For example, I have been experimenting with healthier foods to substitute for the junk food I love to eat. One helpful thing you can do is to take an inventory of your habits. One of my downfalls is failing to schedule my day and succumbing to what I call piddling around. This is anything that takes me off my game, from aimlessly surfing the Internet to reading emails that probably should just go in the trash. I’m not sure what puts me into piddling mode. Maybe I need a break from writing and should just get up and stretch. Maybe I should shift to something less cerebral like updating my calendar or paying bills. Who knows, but it’s something I’ve identified for improvement. What habits do you need to change, and how do you plan to do it? This entry was posted in Goal setting, Management, Staying motivated and tagged behavior, change, Charles Duhigg, cues, habits. Bookmark the permalink. 9 Responses to Don’t be a creature of habit, change your routine! Your body warns you against disease. You should listen to your body so you can be released from your habits. Pingback: Write Habits? | Wilson K.
We are truly creatures of habit. Changing any habit can be challenging but also interesting and fun. At least that’s what I tell myself! Victoria, I agree! Thanks for your comment.